SuperKlean Model 3600BM offers a hot & cold water mixing units with ball valves for easier shutoff while maintaining its original characteristics. The unit uses “Y” style body mechanics with lift check valves and ball joint unions for superior flexibility during installation. SuperKlean’s inlet center lines have the same dimensions as most of our competitors’ units. Our units come with a mounting plate for easy behind the unit cleanup, hose rack for easy user access to the hose, and an optional temperature gauge for accurate temperature readings at outlet. Temperature Gauge: (optional) Stainless Steel Weight: 13 Lbs. 3600BM.B.T Brass, hot & cold water wall mounted mlxer-hose station. Includes ball valves, check valves, hose rack, mounting bracket, and temperature gauge. 3600BM·B Brass, hot & cold water wall mounted mlxer-hose station. Includes ball valves, check valves, hose rack, and mounting bracket. 3600BM-S 300 series stainless steel, hot & cold water wall mounted mlxer-hose station. Includes ball valves, check valves, hose rack, and mounting bracket. 3600BM-S-T 300 series stainless steel, hot & cold water wall mounted mlxer-hose station. 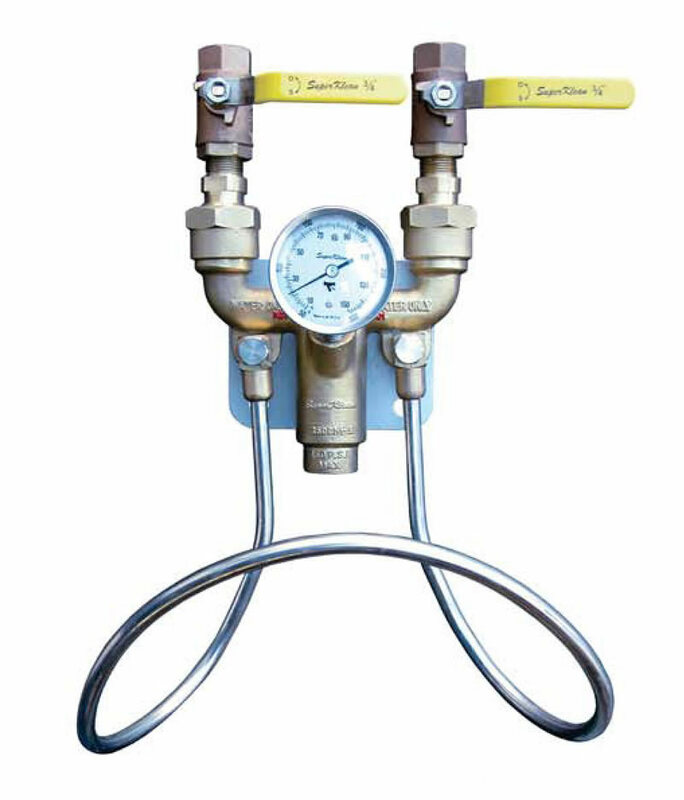 Includes ball valves, check valves, hose rack, mounting bracket, and temperature gauge.